Thanks to Wardeh, at GNOWFGLINS™, last year I finally learned to sprout my own seeds for eating. Why didn't I do this sooner?! I mean, it's easy; no... seriously... really EASY!! Sometimes I over analyze things and make it harder than it really is, but in this case, just being able to see her do this on video made all the pieces fit together. I finally achieved success and started sprouting on a routine basis. 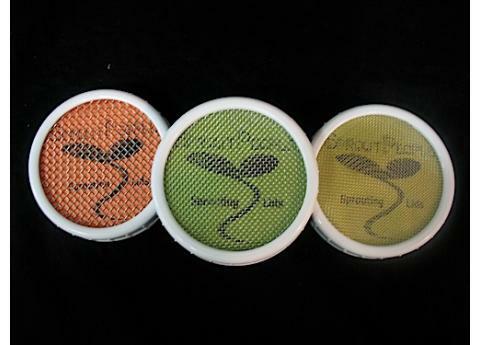 Why sprout your own seeds? Nutrients, baby! Lots of great nutrients: antioxidants, chlorophyll, vitamins, minerals, enzymes, amino acids, and even protein, just to name a few of the many benefits. Also, when seeds are soaked and sprouted, the phytic acid, which inhibits mineral absorption, is neutralized. And during the winter when root vegetables abound, it's nice to have something fresh, green, and living to add to your diet. What can you do with sprouts? Lots. Most people like them best on salads, but they're also good on sandwiches or on chicken salad and things like that. You can also barely sprout bean seeds and use them in soup or as the bean ingredient in bean dips. Some people even let the beans or seeds sprout and then dehydrate them and eventually grind them to use as a flour substitute. I'm finding that I actually like sprouts as a salad itself (no lettuce). Just add things like onion, tomato, nuts, or anything else you would like on a regular salad. How do you sprout seeds? There are several ways to do this using any number of devices and equipment. I'm going to show you my favorite which also is the easiest and least expensive in my opinion (I've tried a couple). * I have used Sprout People as my supplier of sprouting needs for a couple of years and have been extremely pleased with their products. I do not have a working relationship with them and receive no compensation for recommending their items. I just like their products; this is what they DO. It's not a side to another business or a part of a larger vision. Sprouting seeds IS their vision. 1. Place seeds in jar, attach the appropriate size lid based on your seed size. You want the seeds to stay in the jar, not come out. 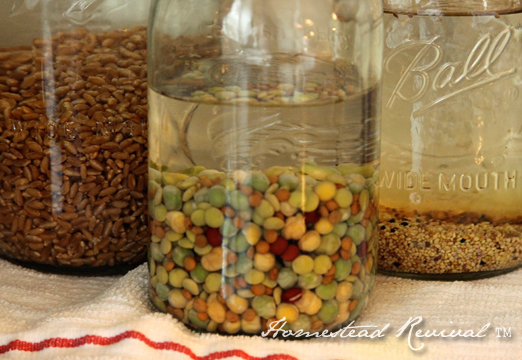 Fill jar with cool water until it more than covers the seeds. I usually fill the jar about 3/4 full. Allow to sit over night or about 8 hours. 2. The next morning, pour out water and rinse seeds really well. Do this several times as the seeds will have colored the water slightly. I usually do this until it comes off clear. Drain well in your dish rack or in some way to allow the remaining water to drain off. Then lay the jar on it's side in a dark corner of your kitchen, spreading the seeds in the jar by shaking it a bit. You want them to be moist, but not wet, and air to circulate around them. And it doesn't have to be super dark, just on the counter in a corner is perfect. 3. Repeat step 2 twice a day until sprouted to your liking. This usually takes about 3 days but it can be as much as 5. 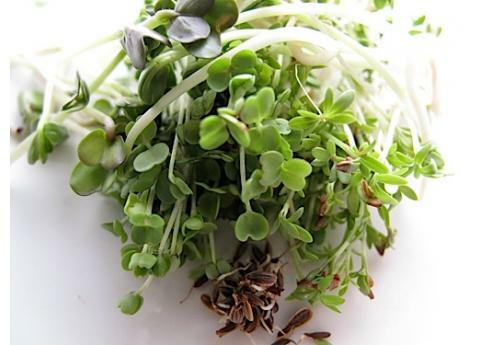 Once the seeds start to produce the "sprout", you can move it to a brighter spot with indirect sunlight or gentle sunlight to green them up a bit, but avoid too much direct sunlight or it will dry the little sprouts out and they'll die. Be sure to rinse more often if the temperature in your kitchen is warm and they appear to be drying out. Just think of these as mini plants that need to stay moist. If you do a lot of seeds at once, you'll find they bunch up and the ones in the middle stay too wet. Just use a fork to break them up and next time, reduce the number of seeds per jar. 4. When the sprouts are about the size you desire, do not rinse on the next occasion, but instead, replace the lid with a cap and move them to the refrigerator. This is just one of many things I learned in Wardeh's Fundamentals eCourse at GNOWFGLINS™, and she does a much better job teaching about this than I have in this short post. I want to encourage you to give her eCourse a try, or sign up for her Cultured Dairy and Basic Cheese Class starting in February. 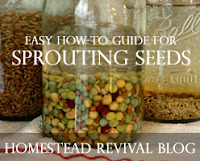 There's so much more to sprouting; different types of seeds, beans, grains as well as techniques and uses. And this has just scratched the surface. But it's enough to get you started and the investment is minimal. Why not give it a try? 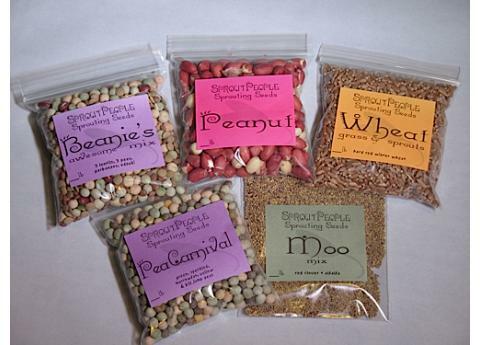 If you've sprouted seeds before, what kind are your favorite and how do you use them?